After sp ending most of the morning enchanted by the Buddhist caves we moved on to the most famous Hindu Cave, the Kailash cave. Out of all the caves at Ellora, Kailash cave is the most phenomenal of them all. All the Ellora caves are hewn out of the volcanic lava of the Deccan plateau; but nowhere is this more prominent than in the Kailash cave. This mountain has been cut vertically, from top to bottom and almost 200,000 tons of rock has been scooped out to build a temple that is 200 feet long, 150 feet wide and 100 feet high. Kailash cave is the largest monolithic excavation in the world and is truly an epitome of human genius and ingenuity.The temple is divided into four sections, the entrance courtyard, the main temple, the Nan di temple next to it and, many small temple cloisters around the main temple. Having heard and read a lot about the Kailash cave our expectations were really high even before we entered it but even then we were struck dumb by what we saw. As soon as we entered the courtyard, we saw magnificent elephants built out of monolithic rocks flanked b y two very beautifully and intricately carved pillars. These pillars are said to have once borne the Trishul of Lord Shiva. The most amazing thing about this cave is that each panel, alcove and nook and corner of the walls in the courtyard is a wealth of sculptures and carvings. Even the base of the walls have carvings running along them. 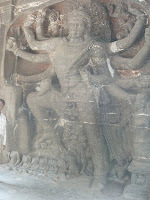 The sculptures are simply spectacular and potray tales out of mythology. There is a sculpture of Ravana shaking Mt.Kailash, of Sugreev and Bali fighting, descent of ganga, Shiva Parvati playin g chess, various forms of shiva such as Dakshinamurti and nataraja, marriage of lord shiva and Parvati, the various avatars of Vishnu, an image of Ganga Yamuna and Saraswati etc.The main temple on the first floor is built on a great block of rock to represent Mount Kailash, the abode of lord Shiva. 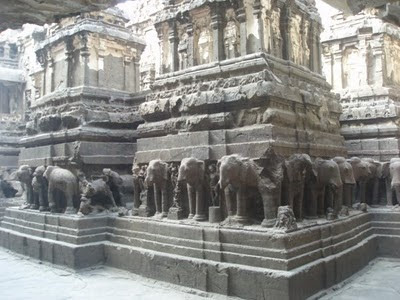 The base of the temple structure has elephants carved on all sides;it seems as if the temple is supported on the back of these elephants. The garh griha in the temple has a huge Shivaling and the ceiling above is decorated with intricately carved Lotus.There are various other images on the roof of the temple, including a enormous nataraj and ano ther one of Shiva fighting with a demon carved on the roof. The amazing thing is that from whichever angle you look at this sculpture it seems lord shiva is looking at you. Not only have the artisans managed to carve on the roof with all the dust, rock pieces falling in their eyes, but they have produced such masterpieces. The temple has a lot of paintings alongside the sculptures, the paintings sadly in a very bad state. We spent all our time walking about, totally lost in the spiritual splendor around us. Its not easy to explain the sheer magnitude of the beauty and the effect that it had on us. It was pure visual delight. There is no sparseness in the Kailash cave like in the Buddhist caves. Every nook and corner has been touched by the sculptor’s hammer. And the end result is sculptures and carvings of such magnificence that one simply wanders here and there totally mesmerized and awestruck at how such miracles were achieved using just a chisel and hammer. After visiting the cave,we ate lunch at the local canteen, simple thali food of Daal, sabzi and roti but much enjoyed over animated and interesting conversation. We went on to the Jain caves after lunch but they were not so impressive after the Kailash cave but impressive in their own right. The elusive Navneet had finally arrived and caught up with us at the Kailash cave. Since she had missed out on the Buddhist caves, she decided to visit them while we roamed about outside. It was almost closing time by then and all the tourist buses had left. There was not a single person in sight we had the place totally to ourselves. In the evening twilight the caves looked silent and peaceful. As we gazed at the phenomenal piece of history in front of us it was as if we had gone back thousands of years in time. It made a very fitting end to a wonderful day. Beautiful pictures and a running commentary that makes you feel as if you were a part of it over the last 3 posts. Thanks for your effort. And it reminded me of Halebid (Halébeedu in Kannada for Hindu-Jain influences). Wonderful sculptors and painters. Buddhism and Jainism flourished in South India at one period as well. Nice post. 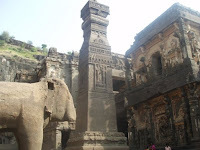 Ellora Caves, an extraordinary compound of Buddhist, Hindu, and Jain cave. Temples and ancient monument must visit. In total there are 34 caves out of them 12 are Buddhist caves, 17 are Hindu caves and 5 are Jain caves. 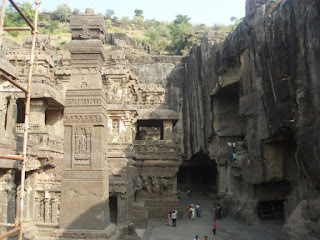 Cave 32 is a small version of the Kailash Temple. Time to visit is for cave is vsunrise until sunset from Wednesday to Monday. Brilliant, going through your writing was like a visual flashback of the wonderful trip. The entire essence have been brought out vividly. Thanks Ruchira, keep on rolling. Thanks Navneet ! glad u enjoyed it !